• Pike Place’s iconic signs are at the bottom of a hill, the best spot for pictures is the center of the 1st & Pine Street crosswalk. • You have 25 seconds every 3 minutes to get the perfect shot! 2. Adventure out to the Secret Rooftop Garden for pictures. 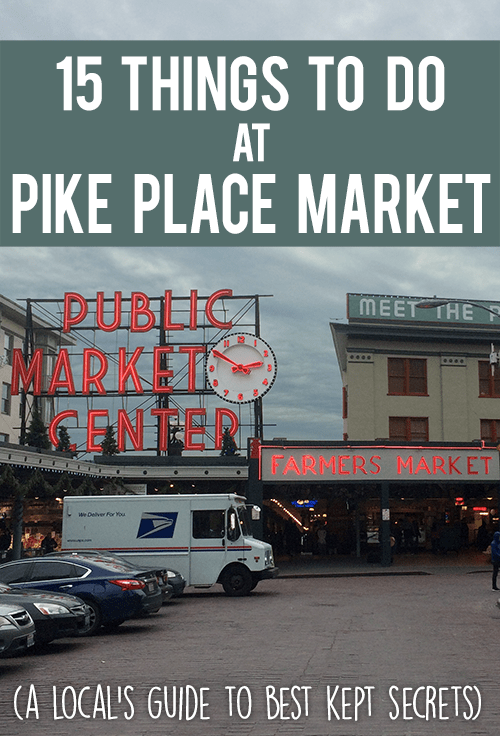 • Pike place is actually a low-income neighborhood in Seattle with many unhoused and precariously-housed residents. Donations support health care for locals, a senior center, and support vendors’ families if they become ill or unable to work. • Claims to the “best chowder” abound in the neighborhood, but take the advice of this local who has tried them all and head to Market Grill right in the thick of the market. • 80% of tourists only see the main thoroughfare, but there is so much more going on if you adventure downstairs and check out the halls leading off the main markets. • Just take the stairs down located directly under the giant neon clock. • You can pick up gum at the newstand nearby or at Target, 1 block away. 7. Check out the food counter at Oriental Market. • If you’ve never tried Filipino food, the time is now. Owner Laila’s well-known snark just adds charm to this local favorite. • Flower sellers will make custom bouquets if you ask- just tell them what colors/flowers & what you want to pay. • If travel plans demand no bouquets, you can still have the experience (and a cheap souvenir) just ask for purchase $1 worth of filler flowers and press them in your travel journal. • Snap a picture if you must, then beat the crowd by climbing the stairs to local favorite Storyville Coffee, with a fireplace, ample seating, and amazing views overlooking the market. 10. Catch a mini-show by hanging out at the Pastry Pet booth. • Each plush cat-donut (yes, cat-donut) sold gets a dramatic send-off that’s worth waiting around for. 11. Try to see how many food counters you can hit with a budget of $10. • Work your way through the market one small bite at a time. Don’t forget fruit vendors! 12. Sample what’s in season. • Don’t miss winter’s offering of Apple Cider citrus, and spices. • Find the unmarked pink door in Post Ally to reveal a mid-priced local favorite restaurant featuring cabaret & trapeze artists on weekends. 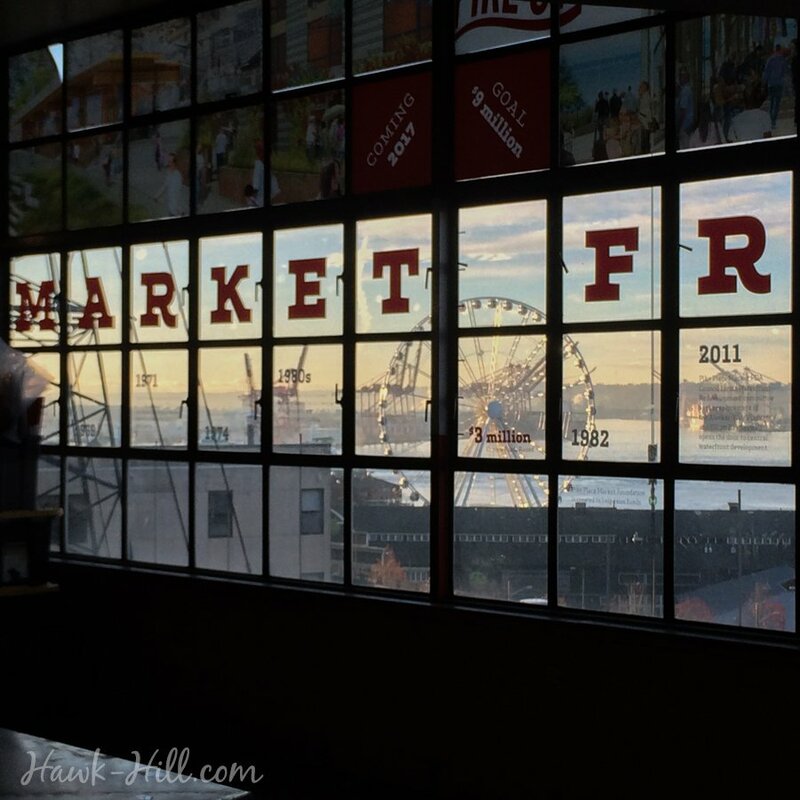 • Their recent expansion means you can dine with a view of the market. • They push the lasagne, but I’d get into a fist fight over their meatball-stuffed baguette. • If you have daylight left, head a few blocks to the ferry dock. You can’t beat the $8 roundtrip ticket for a sunset cruise across the Puget Sound. #1 Tip: Start early if you want to visit the biggest tourist spots. Starbucks & Piroshky Piroshky won’t have long lines till 10am or so. #2 Tip: Whatever you do, DON’T drive and park. Parking in this neighborhood can be up to $20 per hour. Using a ride sharing app can get you free rides if you use promos to sign up. Use this link for $50 in ride from Lyft and This link for $20 credit from Uber.